This was a fabulous project, in Rickmansworth, Hertfordshire, which we did for a developer who was building a new house, a rather big house, with 6 bathrooms! As it was a new build, we had a clean sheet of paper but some very specific requirements to work to. 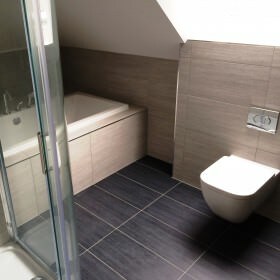 We installed a complete heating and hot water system, high spec and fully programmable, as well as installing all the bathroom furniture and all the plumbing for every other part of the house. The project was completed very smoothly, ahead of schedule and was highly enjoyable both for our team and for our client.